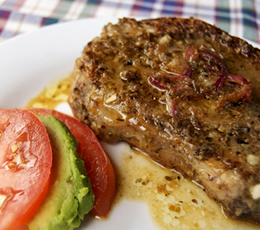 Thanks to our Featured Foodie, Savour the Senses, here’s a delicious, tangy, pork chop recipe that’s a must try! In a large, sealable container, mix 1 cup orange juice, 1/2 cup lime juice and pork. Let marinate, refrigerated, for 1 hour. In a small bowl, mix together the pepper, cumin, cayenne pepper, garlic powder and oregano. Dry the pork chops and coat with the spice mixture. In a large skillet, heat the olive oil over high heat and sear each side of the pork chops (about 1 minute per side). Reduce the heat to medium-low, add the onion and garlic and cook for an additional minute or two. Add the 1/4 cup orange juice, 1/4 cup lime juice and white wine. Reduce the heat to low and let simmer until the liquid is reduced, slightly thickened and the chops are cooked through (about 5-10 minutes). Remove the pork from the pan and cover to keep warm. Reduce the liquid again by half, then pour over the pork before serving.